��� It is really annoying to me as an Australian film buff that so many movies live or die based on either US social media or initial critical reaction which often means that films which are a little different or touch on complex issues disappear. 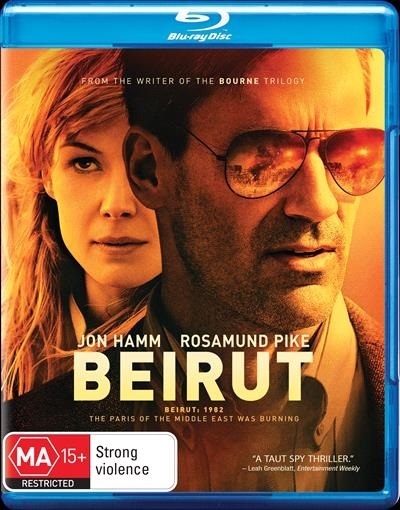 This film, Beirut, starring Jon Hamm and Rosamund Pike was pretty much sunk seemingly due to social media reaction to its trailer, before it was even released. The trailer included a catchphrase which was taken as a criticism of the Lebanese people but in the context of the film itself was a comment on the whole Middle East region. Personally, I first saw this film on a plane with no prior knowledge of what it was and thoroughly enjoyed it. When it arrived for review I was keen to see it again and enjoyed it again. I watched it with someone of Lebanese heritage and they found the film interesting and enjoyable as well. It is important to note that this is a fictional story which uses the setting of the Lebanese Civil War for a spy thriller. Some of the things which occur in the film were inspired by real events but it is fictional. It is not meant to be a history documentary. It was written by Tony Gilroy, twice Oscar-nominated writer of films like Michael Clayton, the Bourne films, Armageddon and Rogue One, possibly the best of the recent Star Wars films. He first wrote the screenplay back in 1992, shortly after the film's events occurred, and it has taken until 2018 to bring it to the screen. It was directed by Brad Anderson, who has made a few feature films, in amongst lots of television. Due, at least in part, to the trailer uproar this film only did $7 million at the global box office, including a very limited Australian theatrical release. It was released in the UK with the title, The Negotiator, possibly as a reaction to the trailer fiasco. ��� This is a taut spy thriller which was shot digitally but with vintage lenses to give a look and feel of the time the film is set, the 1970s and 80s. The film starts in 1972, before the war, with Mason Skiles (Jon Hamm) living happily in Beirut as the Deputy Chief of the US mission in Lebanon. He enjoys his work, has married a beautiful Lebanese woman, Nadia (Leila Behkti) and is hosting a reception at his house for visiting congressmen. A boy, Karim, from one of the refugee camps has been semi-adopted by the couple and is helping them with the reception. Cal Riley (Mark Pellegrino), a friend of Mason's and one of the local CIA contingent arrives at the party, telling Mason that the CIA have arrived to take Karim away to hand him over to Mossad. Karim, it would seem, is the younger brother of a wanted terrorist who was involved in the deaths at the Munich Olympics. As far as Mason and his wife knew, Karim was an orphan. As Mason argues with the CIA, a group of masked terrorists arrive and kidnap Karim. During the ensuing violence, Nadia is killed in crossfire. ��� 10 years later, Mason is a broken man. Back in the US, he is an alcoholic doing small-time industrial relations negotiations. He is approached by an old friend who tells him that the American University in Beirut want him to come and speak but it is pretty obvious that the CIA want him in Beirut for some reason. As he is pretty low and they give him a significant amount of money he agrees to go and arrives in Beirut without understanding why he is there. He is initially met by a representative of the University and taken to a hotel but is soon contacted by local CIA officer, Sandy Crowder (Rosamund Pike) who takes him to meet up with the Ambassador, Frank Whalen (Larry Pine), who he knows from the past, the local National Security Council representative, Col Ruzak (Shae Wigham), and the Head of Security at the Embassy, Don Gaines (Dean Norris). They tell him that his friend, Cal, who he hasn't seen for 10 years, has been snatched off the street in Beirut and his kidnappers are demanding that Mason be the one to negotiate with them. Can Mason save his friend while dealing with the CIA, Ruzak, Mossad, the PLO and other factions? ��� This is a quality spy thriller with an interesting plot, set in a time and place which has not often been covered in western movies. The leads are good with Jon Hamm doing an excellent job as the bleary Mason Skiles. The film was shot in Tangiers, Morocco which due to some issues in the construction industry over the last ten years has many derelict and half constructed buildings providing a good replacement for 1980s Beirut. The music is certainly evocative, mostly middle eastern music and the occasional song of the time. It adds excellent atmosphere as does the grimy, period colour scheme which places you in the dusty and threatening atmosphere of the Middle East at the time. I cannot understand for the life of me how this film can get the same rating as Mile 22 (which I reviewed recently), for the same reason "Strong Violence". There is nothing like the violence level in this film as in that one. ��� Those who enjoy spy thrillers which don't feel the need to resort to too much violence and torture scenes will enjoy this. Recommended. ����The video quality is very good with the restrictions due to the shooting style and cinematography rather than the transfer itself. ��� The feature is presented in a 2.40:1 aspect ratio which�is�the original aspect ratio in 1080p. As I mentioned earlier the film was shot digitally but using vintage lenses which gives the film a dusty, softer look than usual digital photography. This certainly evokes the time and place but does not result in the pristine home cinema experience that we have come to expect. This is also combined with some hand-held and sometimes jerky camera work. There is also a resulting lack of shadow detail in what is quite a dark film, often done with natural lighting. I also read that the production had some problems with access to electricity which may have contributed. Regardless, none of these things are problems with the transfer which utilises a high bit rate generally to portray the film as intended with nothing to note in the way of artefacts. I did not notice any motion blur, banding or macro-blocking. ��� The colour is good although this film purposefully has a mostly dull colour scheme with grimy apartments, offices and rooms as the scene of much of the action. ����There are�subtitles available in English for the Hearing Impaired which are clear and easy to read. Arabic, French or heavily accented dialogue is subtitled by forced English subtitles as well. Usually these do not clash with each other for screen real estate. ����This disc contains an English soundtrack in DTS HD-MA 5.1 and a descriptive audio track in DTS HD-MA 2.0. This is a good quality soundtrack with lots of atmosphere in street scenes, distant explosions and gunfire, good surround in action sequences and room filling music. ����Dialogue was clear and easy to understand on most occasions (although the subtitles were useful at times). � ��The�subwoofer did a good job supporting the action, music, crashes, explosions etc. � � The US release of this film has the same technical specifications but adds two short featurettes as extras. A win to the US but based on reviews not really worth importing for. �� �A quality spy thriller set in an interesting time and place. ��� The video quality is very good but restricted by the source material. ��� The extras got snatched off the street.